4 points if you can tell me where this is. 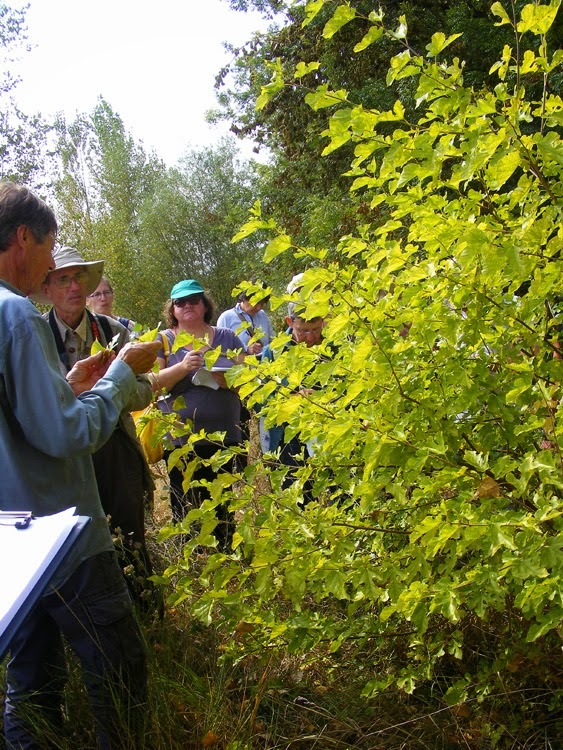 Fungi Foray: The Association de Botanique et de Mycologie de Sainte Maure de Touraine has organised a fungi outing to the Forest of Larçay for Saturday 4 October. Meet at the carpark by the entry to the forest at 2.30 pm. 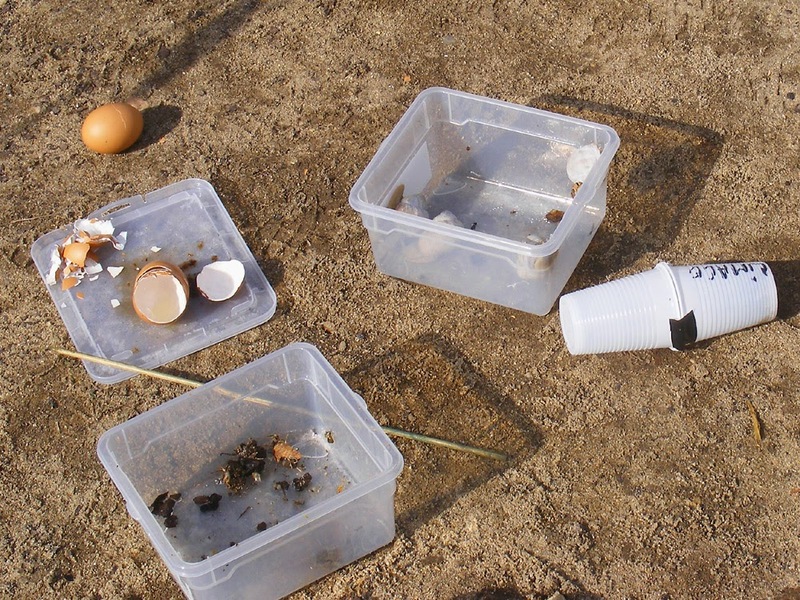 The fungi gathered will be displayed and identified in the carpark after the outing. Once on the D943 (old N143), there is a roundabout signposted for 'forêt de Larçay' and 'Crématorium'. Take the Crématorium exit, then after 50 m the little road to the left marked 'forêt de Larçay'. 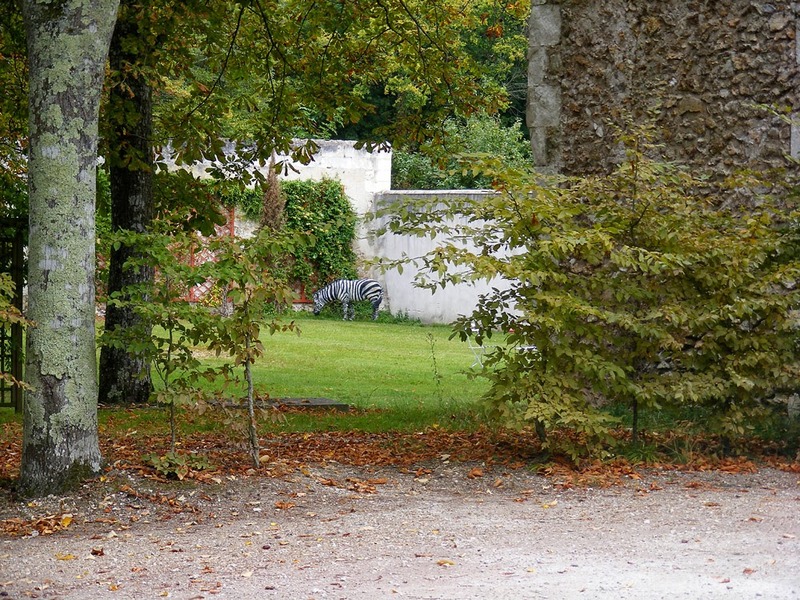 Quiz Results: This life size and extremely realistic model of a zebra has recently been installed in a corner of the garden at the Domaine de Candé. It's visible from the path that goes along the front of the stables and is near the water tower. A point to Colin for realising it's probably cast from a mould. CHM's suggestion of Beauval (the zoo) was good, and what I would have guessed if I didn't know where it really was. 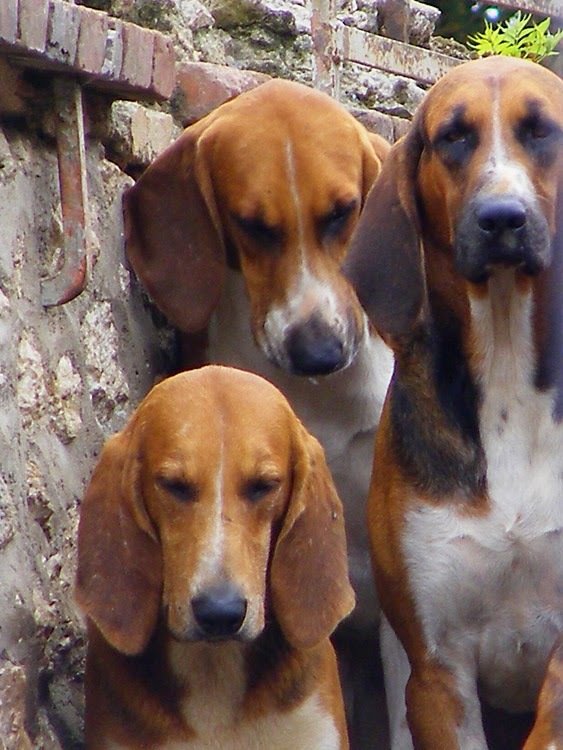 The hounds at Cheverny sit patiently on the steps of their kennel, waiting to be released into the enclosure where their dinner is already laid out. Once the kennelman opens the gate this lot will be off like a shot, and the chicken carcasses and dry food consumed in about 10 seconds flat. A la cuisine hier: Tomato soup, made by roasting tomatoes, peppers, onions and whole garlic bulbs then pureeing and adding stock. Best done in a food mill because otherwise you end up with chewy bits of tomato skin and seeds. A dash of this and that -- balsamic vinegar or hot sauce, for example, can be added. 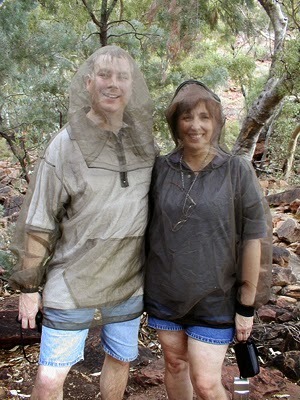 This Canadian couple were taking no chances, at least on the top half, with the notorious bush flies, small black biting flies related to house flies that occur in their gazillions in the outback. 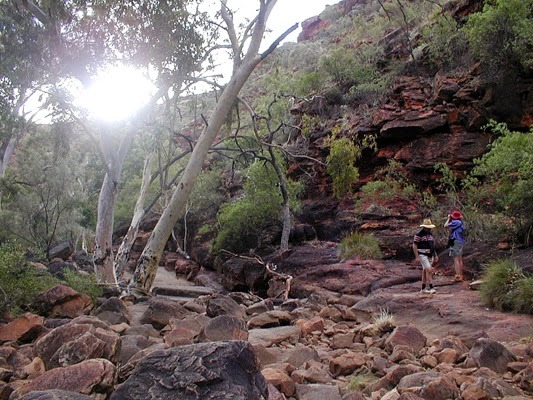 Down in Kings Canyon in the Northern Territory of Australia. 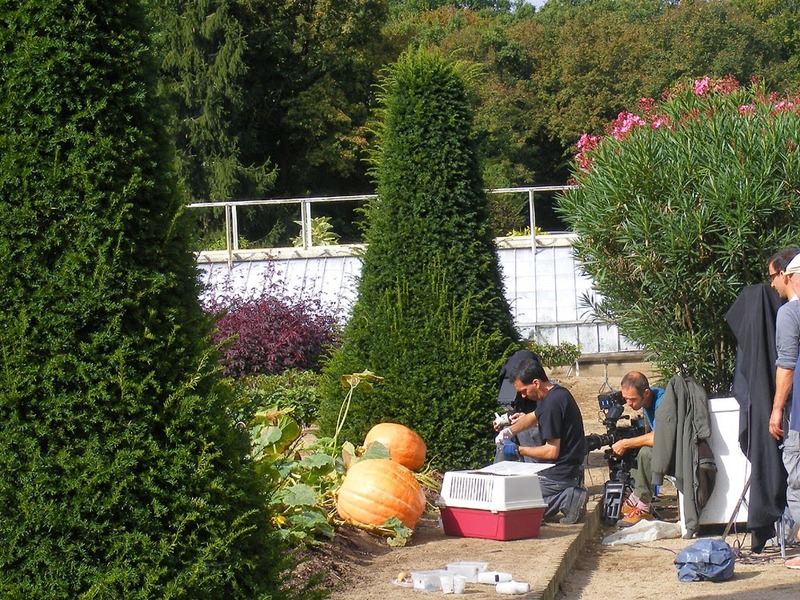 The other day, whilst escorting clients through the kitchen garden at Chenonceau we came across a film crew, on their knees amongst the pumpkins. An assortment of eggs, snails and slugs, as well as the appearance of two cat boxes, alerted me to the fact that they must be filming some creature. I was amused that the snails were not ordinary garden snails, but big Roman snails, the like of which you see gracing plates in restaurants. The slug (Fr. limaces) container was clever -- two plastic cups with a duct tape hinge. A good sized hedgehog! 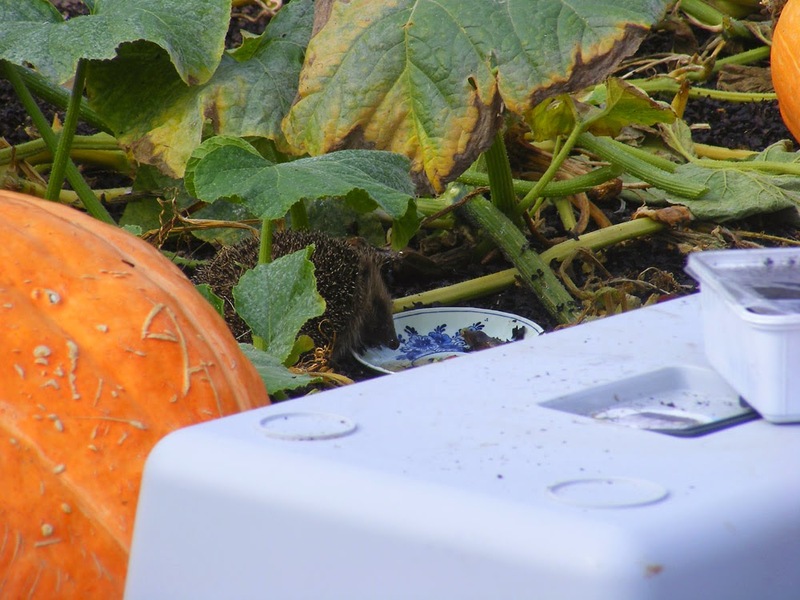 The slug wrangler carefully placed several juicy specimens on the pumpkin stems and the saucer and the hedgehog was gently brushed free of bits of straw bedding by its handler before being placed down on the ground. It ate two substantial slugs in the space of a few seconds! No wonder it looked big and healthy, if it got to eat like this all day! And a good demonstration of why hedgehogs are the gardener's friend. Loire Valley Nature: A new entry for House Centipede Scutigera coleoptrata has been added. They look scary with all those long legs and blindingly fast dashes up the wall but they are your friend in the house, eating cockroaches and silverfish. A photo of a 'flying flock' of sheep grazing added to the entry on Calcareous Grassland (Fr. pelouse). 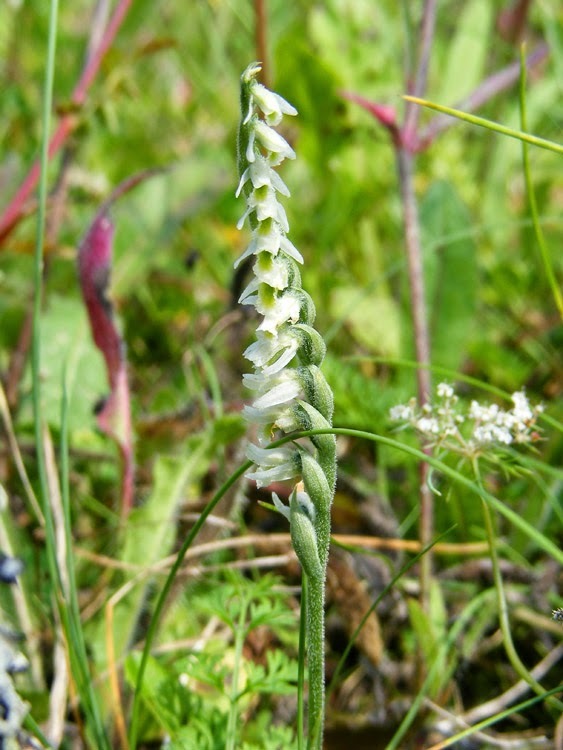 A photo of Short-spurred Fragrant Orchid Gymnadenia odoratissima has been added to the entry for that species. A photo of signs on private property restricting hunting and forbidding the gathering of mushrooms has been added to the entry on Hunting. A new entry has been added for Small Scabious Scabiosa columbaria -- flowering now on calcareous grassland along with its much more common lookalike Field Scabious. A new entry has been added for Small Spreadwing damselfly Lestes virens -- these tiny metallic emerald damselflies are autumn flyers. Au jardin hier: I've finished raking all the 'hay' into windrows. The next step is to roll the windrows up on themselves and shove the resulting bundles of 'hay' under the fruit trees. A la cuisine hier: 13 jars of apple jelly, so we are no longer a jam free zone. Jim's Fundraising for Cancer: Jim Budd has completed his ride from the source of the Loire to the sea. If you haven't yet donated to his chosen cancer charities, it's not too late to do so. He's raised €1015 and £1220 for two charities so far. The links and the story of his ride can be found on his blog here. 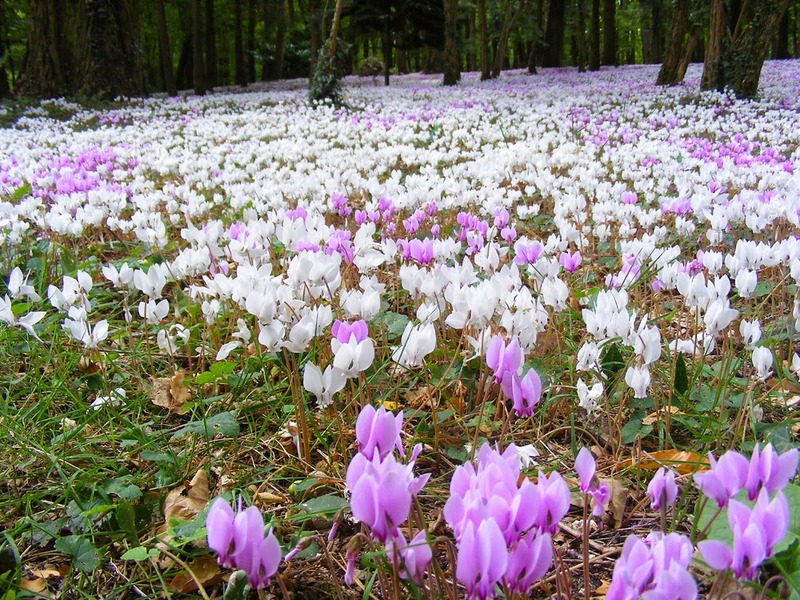 As usual the Chateau Hotel Domaine de la Tortiniere has the most outstanding display of naturalised cyclamen in their park throughout the month of September. 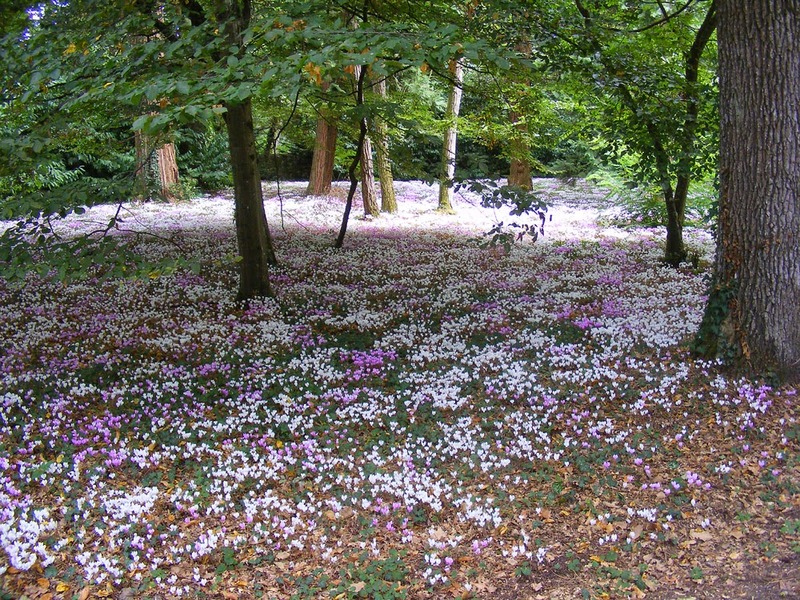 It truly is like a carpet under the trees and in the low light they simply glow. Eye News: Simon had his final check up with the ophthalmic surgeon in Poitiers yesterday. She is happy with the reattachment of the retina, but unfortunately there are several folds in it which are causing a certain amount of distortion in the vision in that eye. She says it happens sometimes and there is nothing to be done about it. The pressure in that eye continues to be a little high, so Simon has to go on using two lots of drops twice a day -- one an anti-inflammatory, the other the infamous Azarga, containing atropine to give you weird dreams if you are not careful and make everything taste metallic. Azarga is to reduce the pressure to stop damage to the optic nerve and prevent glaucoma developing. He is developing cataracts, as expected, and we must make an appointment with the ophthalmologist in the clinic at Chatellerault for 6 weeks time so he can check on progress. In the meantime, much to Simon's frustration, it is not worth getting new glasses, as the left eye will continue to change every day for several months yet. He copes fine for distance (and therefore driving), but using the computer, pouring a cup of tea or chopping up vegetables are all challenging to say the least. Loire Valley Nature: A new entry has been added for sand and gravel habitat. At the end of August I had to go to Paris to meet some clients. They were staying at the Marriott on the Champs-Elysées, so I exited the métro at Champs-Elysées-Clemenceau by the Grand Palais and walked down to the hotel. 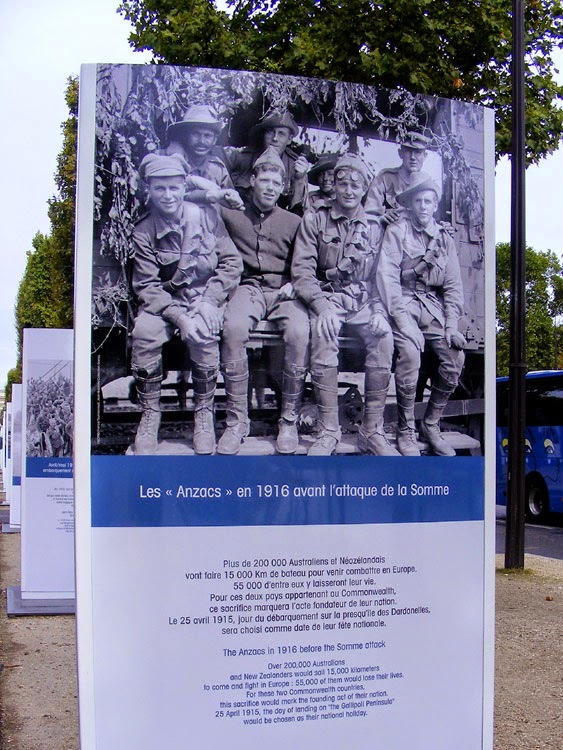 I had time to check out a very moving exhibition of photos taken during the First World War that are on display along a section of the Champs. 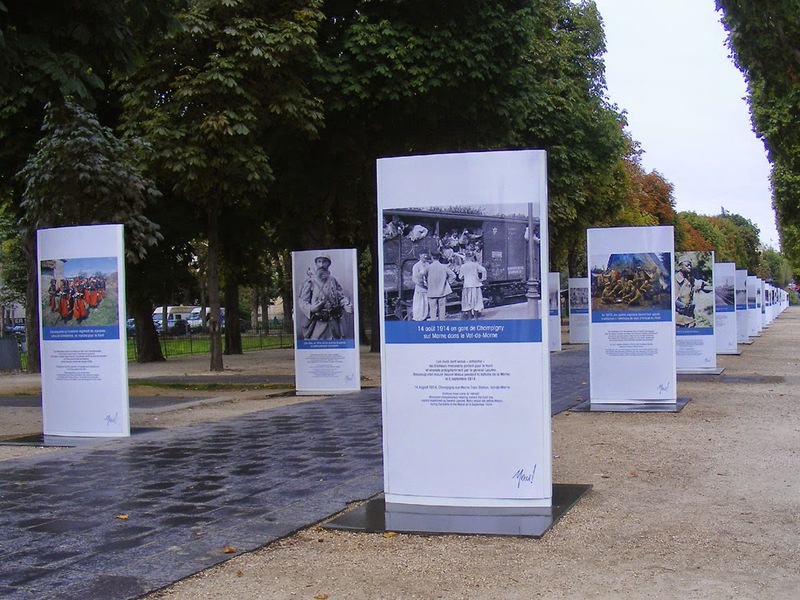 The exhibition of 100 images stretches down the footpath. Anzacs on the eve of the Battle of the Somme in 1916. 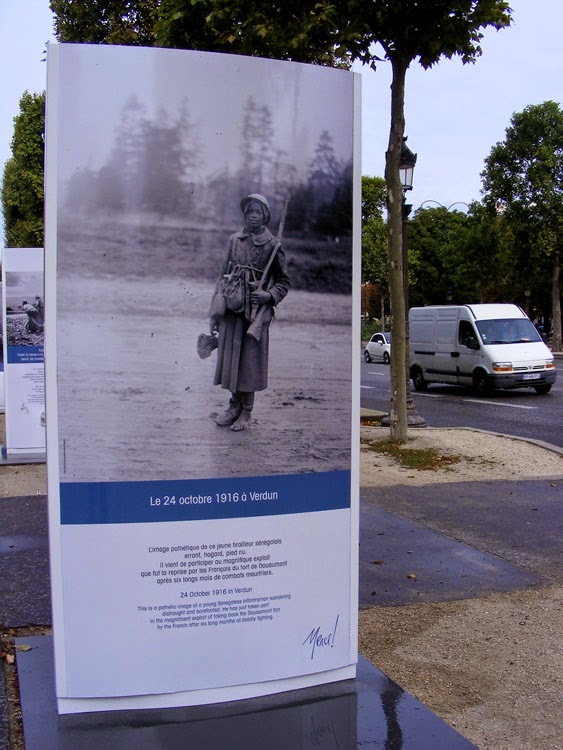 Verdun is the World War I campaign that resonates most strongly for French people. Service dogs were widely used for rescue and communications. 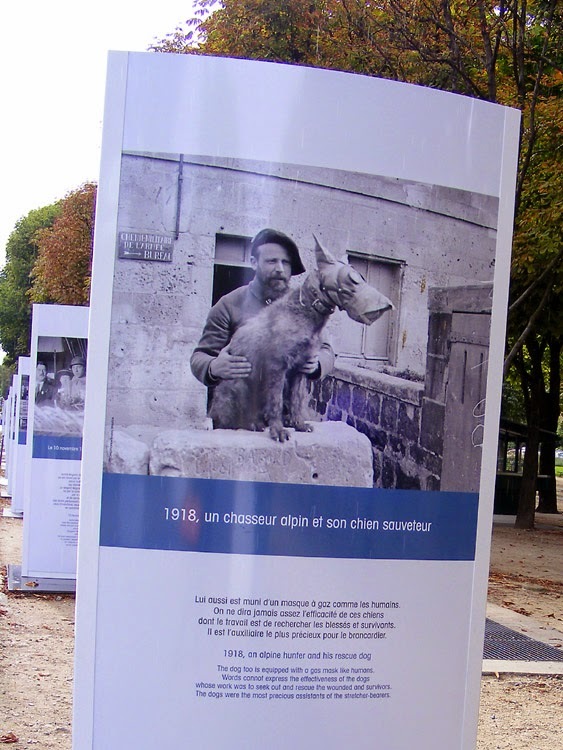 For an account of the actions of one of the most famous messenger dogs and some other interesting pictures of World War I service dogs see here. The Chasseurs Alpins are three elite battalions of French soldiers who specialise in mountain (and more recently, urban) terrains. They are identifiable by their big floppy beret. Fungi Foray: The Association de Botanique et de Mycologie de Sainte Maure de Touraine has organised a fungi outing to the Forest of Preuilly for Sunday 28 September. 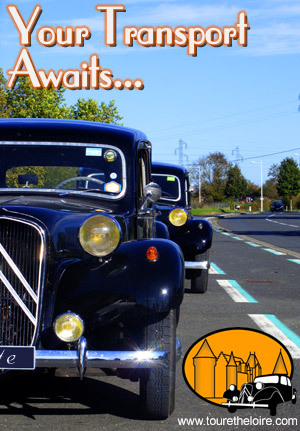 Meet at the carpark by the Etang de Ribaloche at 2.30 pm. The fungi gathered will be displayed and identified in the carpark after the outing. From Preuilly take the D725 towards Azay le Ferron. After 5 km at the lieu-dit La Lieutenauderie go left on to the D63c towards Obterre. The étang is 2 km along this road. From Ligueil or Loches, don't go into Preuilly, but take the D725 just before, towards Azay le Ferron, then follow the directions above. A la cuisine hier: Greekish Salad, with lettuce, red peppers, tomatoes, olives, feta marinated in thyme infused olive oil (one of Simon's current faves), gherkins and a dollop of mint yoghurt dressing. On Saturday 13 September the Association de Botanique et de Mycologie de Sainte Maure de Touraine met at Berthenay, a village on the left bank of the Loire River, on that spit of land which divides the Cher and the Loire before they unite near Villandry and Cinq Mars la Pile. 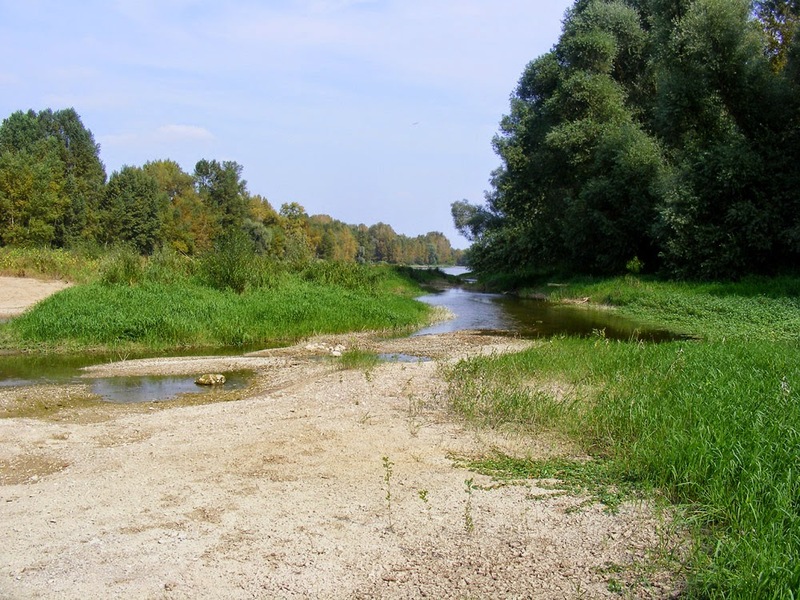 There are several large sand islands in the river at Berthenay, and our objective was to investigate the flora of the Loire sands. Getting there involved me wending my way for an hour and a half via wiggly rural roads from Preuilly sur Claise to Le Grand Pressigny, Descartes, on to La Celle Saint Avant and Sainte Maure de Touraine, hang a left at the big roundabout and through Noyant en Touraine, Saint Epain and Villaines les Rochers (I noticed there's a hemp crop on the outskirts of the basket weavers village) to Azay le Rideau, then it's Villandry, Savonnieres, cross the Cher and finally reach Berthenay. Our meeting place was the church, which is right next door to a restaurant which bills itself as the Restaurant at the end of the World. It's run by a botanically inclined chef, who emerged from the restaurant and accompanied us on our outing. 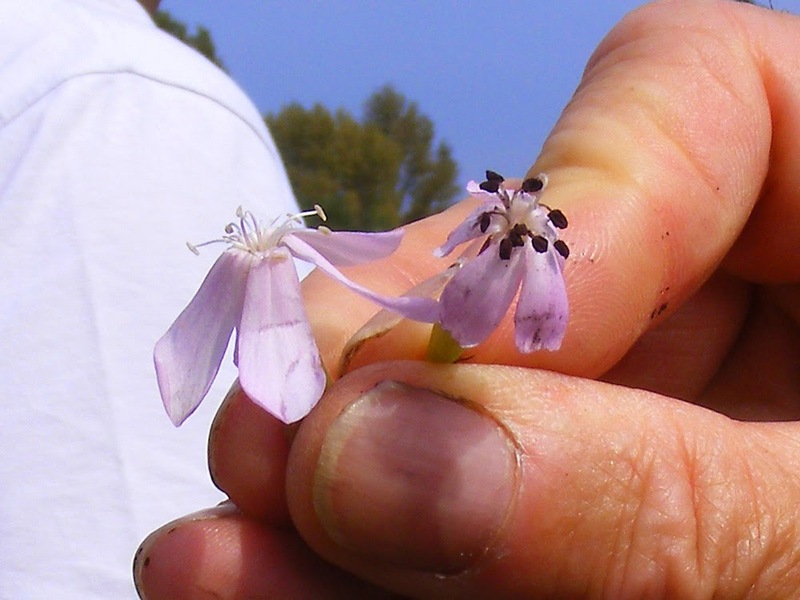 Healthy Soapwort flower on the left, with normal pale stamens; infected by a fungus on the right, with dark stamens. Even before we had left the restaurant garden Dominique was pointing out an interesting feature of the Soapwort Saponaria officinalis planted there. The stamens were infected with a fungus, turning the pollen dark and compromising its functioning. The infected plant doesn't die though, as it will spread by runners as well. The banks of the Loire are an extraordinary mix of invasive aliens (Chinese Mugwort Artemisia verlotiarum; Thorn-apple Datura stromonium; Jimsonweed Bidens frondosa; Water Primrose Ludwigia spp; Chufa Sedge Cyperus esculentus) and rather rare and discreet plants, many of which are normally only found at the coast and reflect the Loire's connection to the Atlantic seabord (Red Bartsia Odontites vernus litoralis; Marsh Woundwort Stachys palustris; Strapwort Corrigiola litoralis; Sea Aster Aster tripolium). One of the introduced plants is a relict of the silk industry, introduced to the Loire in medieval times as the food plant for silkworms. White mulberry can be distinguished from its close cousin Black Mulberry M. nigra by its paler thinner leaves which have many different forms on the one tree. 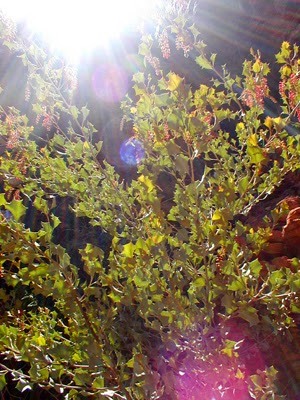 White Mulberry fruit is pale and not interesting to eat, but silkworms thrive on the leaves. 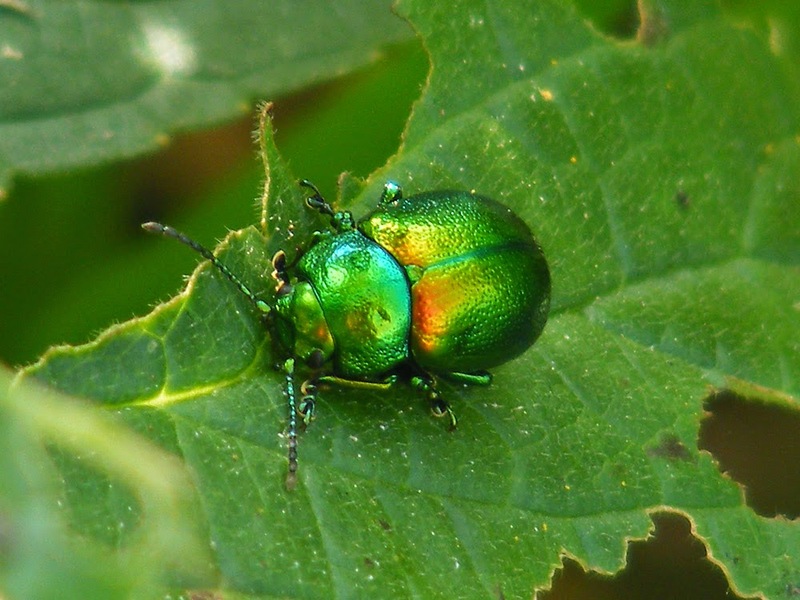 The leaf beetle Chrysolina menthastri. I found this lovely leaf beetle on a well munched leaf of Marsh Woundwort. I assume it is C. menthastri as it looks right and is on the right sort of plant ie Laminaceae Mint family. Female Long-winged Conehead Conocephalus discolor. 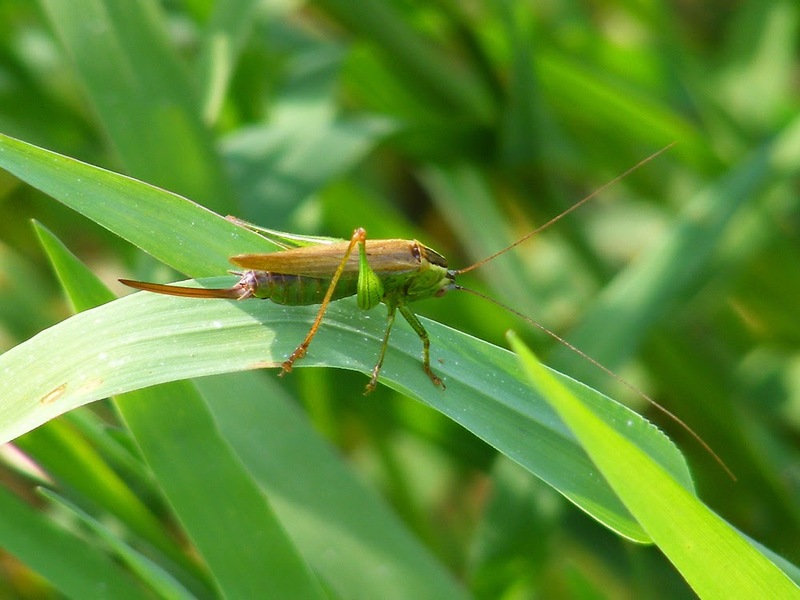 There were dozens of Long-winged Coneheads in the thick Paspalum sp grass (another introduced plant) growing in damper patches on the sands. A view along the river sands. A la cuisine hier: Pasta sauce, slow cooked chopped tomatoes from the Aged Orchard Neighbour, and our own homegrown peppers, chilli, aubergine, onion and garlic. Mostly frozen, but some used on a pizza with homemade dough topped with chorizo, mozzarella and parmesan cheese. 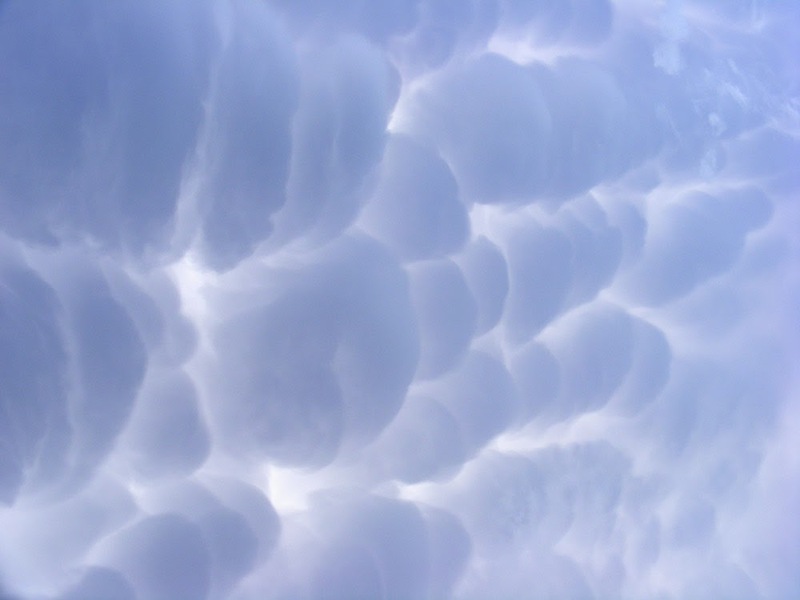 This fascinating cloud formation sailed over the Chateau Gaudrelle caves on Friday evening. They looked ominous, and Alexandre Monmousseau, the winemaker, who had been all smiles previously, regarded them with some unease. He's holding off harvesting until 26 September at the earliest, trying to gain as much ripeness as possible with the warm, sunny weather and the north-easterly breeze. 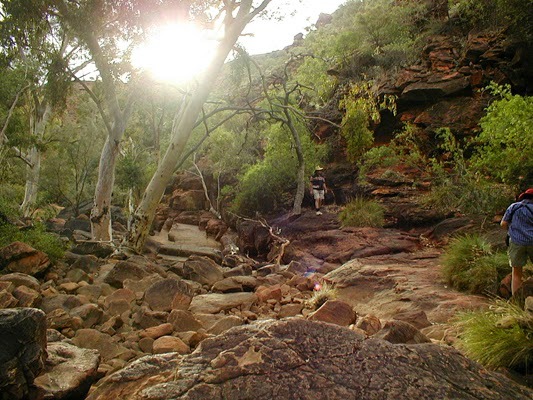 The recent few days of storms have had a bit of useful rain, but otherwise been just a lot of sound and light. The big worry is hail, but very few places in the Touraine are reporting any hailstones falling. 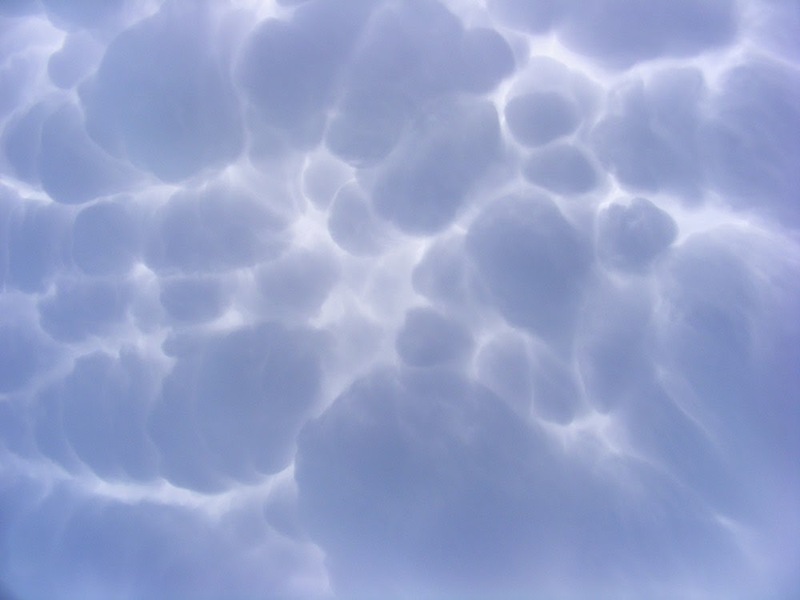 These clouds are, I think, mammatus, which means they look threatening, but are harmless (although the clouds they form from may not be). Then the next day, over our house, Simon took a series of photo of lightning. There was lots of rolling thunder, but not much rain out of this. One lighting bolt lasted over 2 seconds which is longer than his camera will take a series of shots - this is the middle second of that one bolt of lightning. A la cuisine hier: Muesli, made from mixed rolled cereals (4 flocons, in the bio section of Auchan), sultanas, toasted almonds, chopped dried apricots and linseed. A bin bag full of homegrown chard, blanched and frozen. A dozen homegrown pears, poached whole in white wine syrup and bottled (because I've run out of freezer containers). A chicken, pork and mushroom pie which Simon pronounced delicious (and was so filling he nearly couldn't eat dessert!) Served with spicy red cabbage. 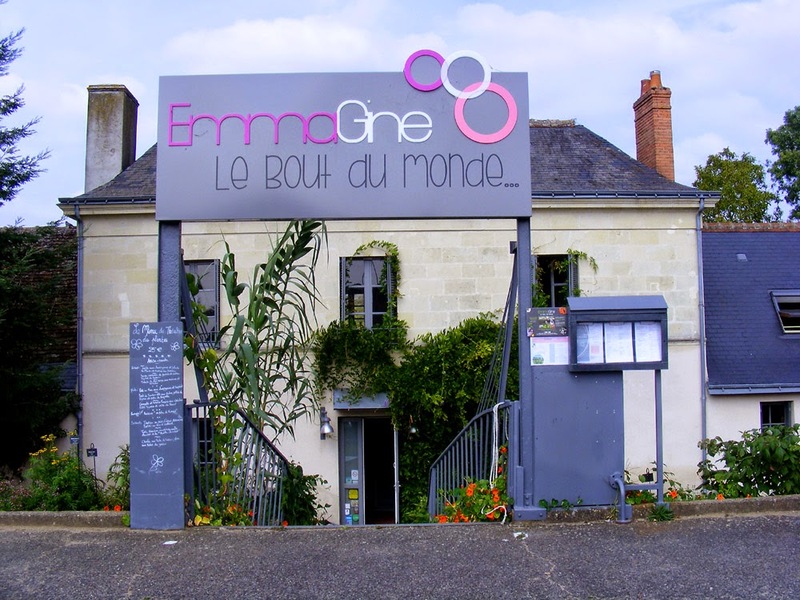 Jim's Cancer Fundraising Ride: Jim Budd will be cycling through the Touraine today on his fundraising mission for teenage cancer. Get out there and support him in person on the cycle path if you can, and even better, make a donation to either the Teenage Cancer Trust or the Fondation Gustave Roussy. If everyone who reads this donated just €5 it would add up to something really significant! 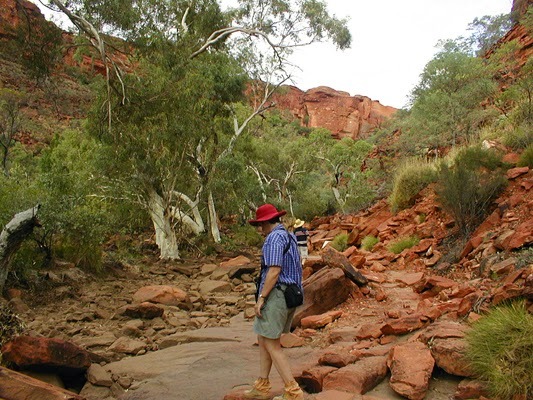 In 2006 I joined my family on a trip that included walking Kings Canyon in the Northern Territory. That's my sister in the first photo and my dad in the fourth. 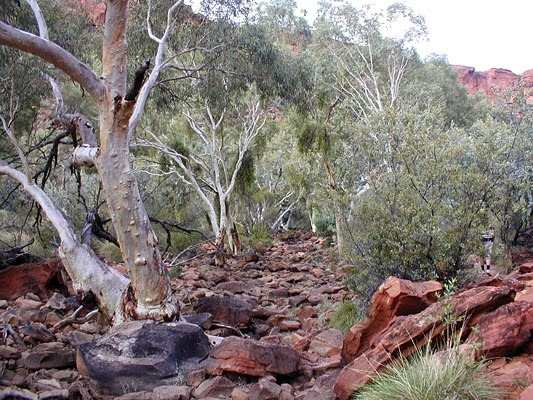 The lovely white trunked trees that grow in the bottom of the canyon are River Red Gums Eucalyptus camaldulensis. A la cuisine hier: Omlette stuffed with onion, tomato, basil and a little parmesan cheese, served with a big green salad. There's no doubt about it, tasty high protein eggs are the go for fast days, combined with vegetables for bulk. 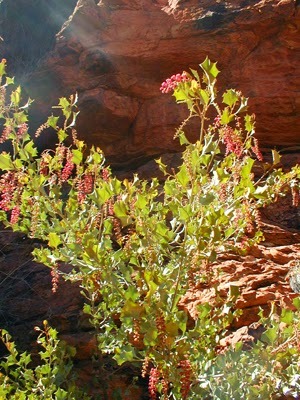 A lovely Australian desert shrub with scarlet spidery flowers and grey-green holly-like leaves. Where we are, these go by the name of pains au chocolat, but I have been reminded that this isn't always the case in France. 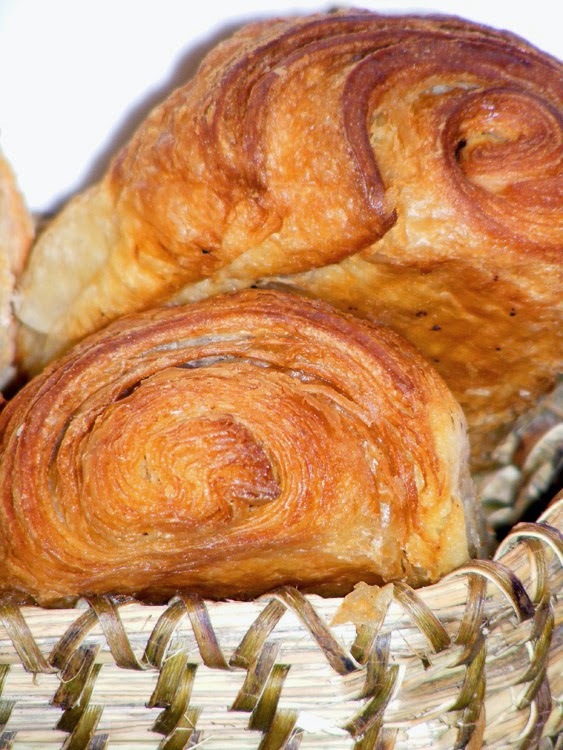 In the Touraine we use the northern term for these chocolate filled pastries, but just across the border, in Poitou-Charentes, to our south-west, which we have visited rather a lot in the last few weeks, I try to remember to ask for une chocolatine in the hospital cafe. They use the southern name for the pastries there. 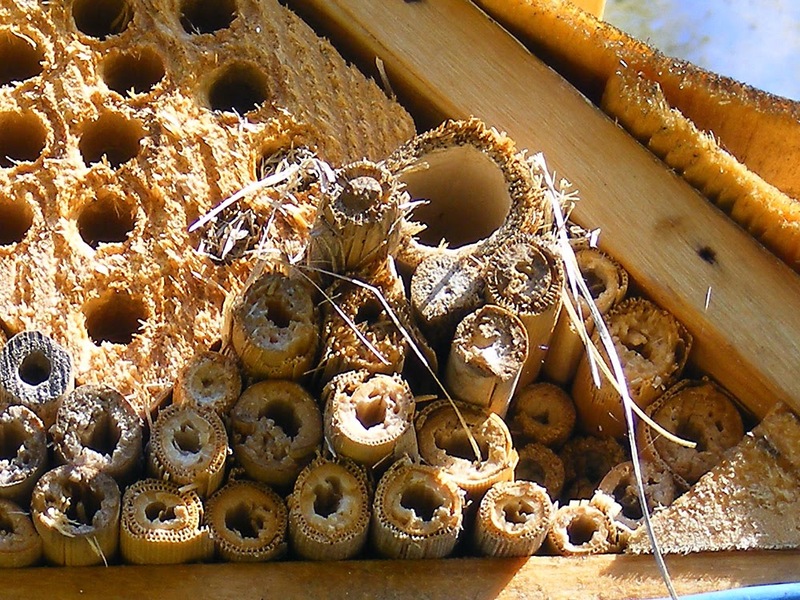 See the dry grass poking out from some of the holes in the bee hotel? That's been put there by the Grass-carrying Wasp Isodontia mexicana. It's a medium-large entirely black wasp which stocks its nest holes with paralysed caterpillars for its young to eat when they hatch, then seals them with wisps of dry grass. The wasp is an introduced, but not invasive, species. This is the bee hotel made for me by Kath, by the way. A friend tells me that she realised she had Grass-carrying Wasps in residence when she started finding paralysed grasshoppers on her windowsills. At first she thought the grasshoppers were dead, but they were always flexible, like they had only just died. Eventually she realised that it was the wasp, who was nesting in some metal tubing above two of the windows. 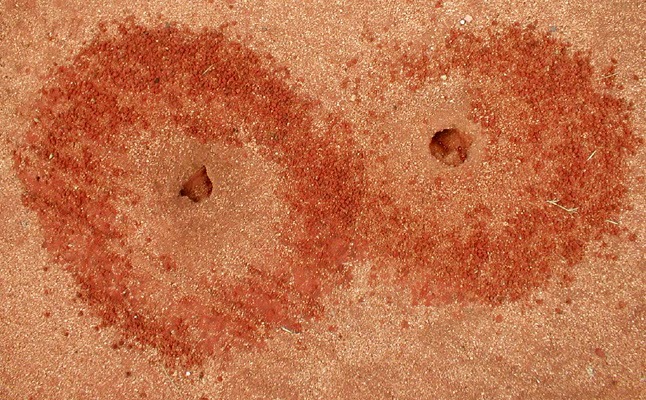 The grasshoppers must have either been too big to cram into the available hole, too heavy and she dropped them, or inserting them in the hole required her to put them down temporarily for some reason. 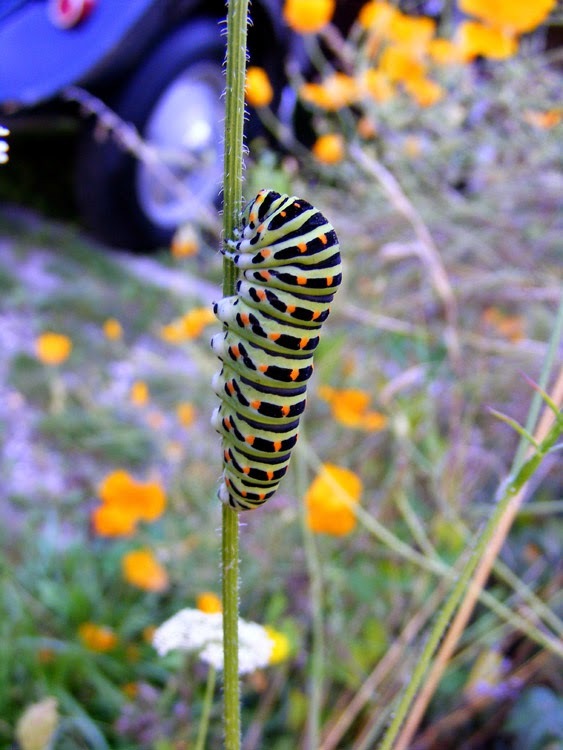 A Eurasian Swallowtail Papilio machaon caterpillar on Wild Carrot Daucus carotta. 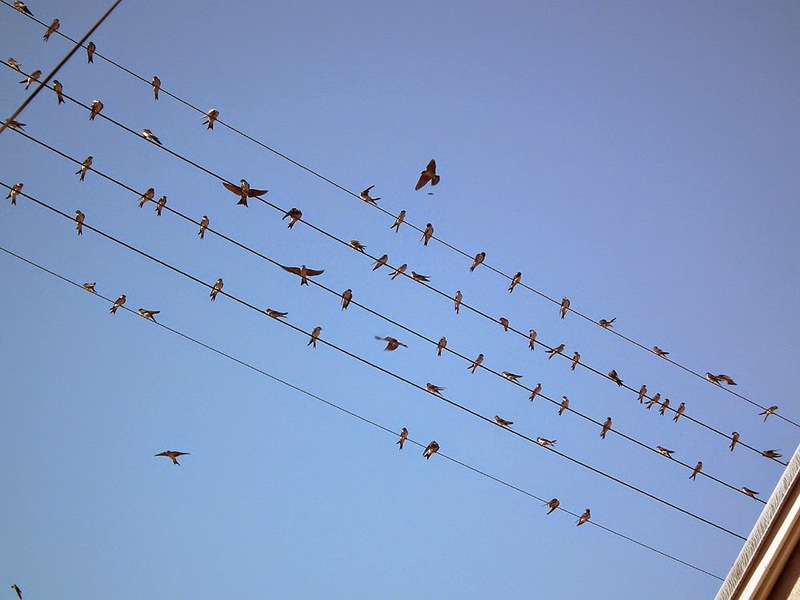 Young Barn Swallows Hirundo rustica gather on the wires prior to migrating to Africa. It won't be long before they've all gone. A lot of 'ours' have gone already and the ones we are still seeing are on their way through from further north. 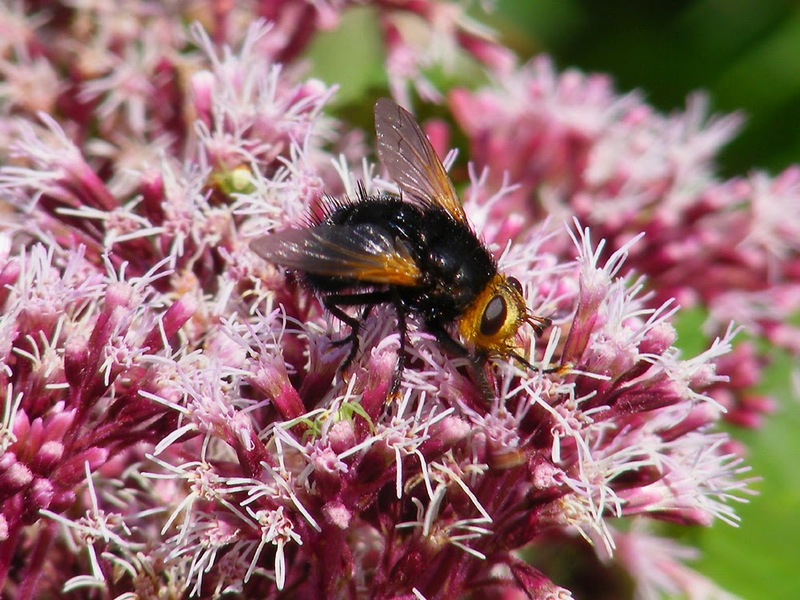 A Giant Tachinid Fly Tachina grossa sips nectar from Hemp-agrimony Eupatorium cannabinum flowers. 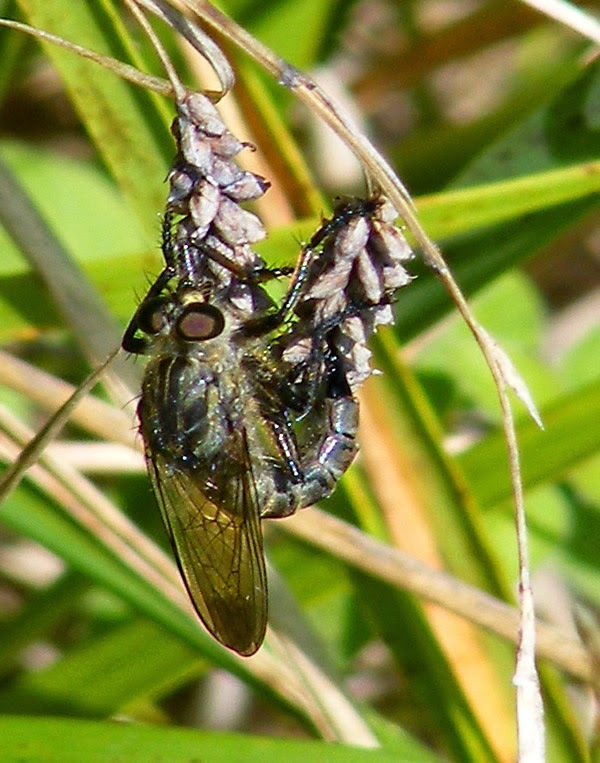 These quite large and distinctive flies are so ugly you have to love them! And don't worry -- they don't carry diseases or come into your house. The archaeologists are halfway through their second dig of the remains of the private chapel associated with the medieval royal apartments in Loches. The discovery of the grave of a dog is perhaps the thing that has engaged the local journalists the most. 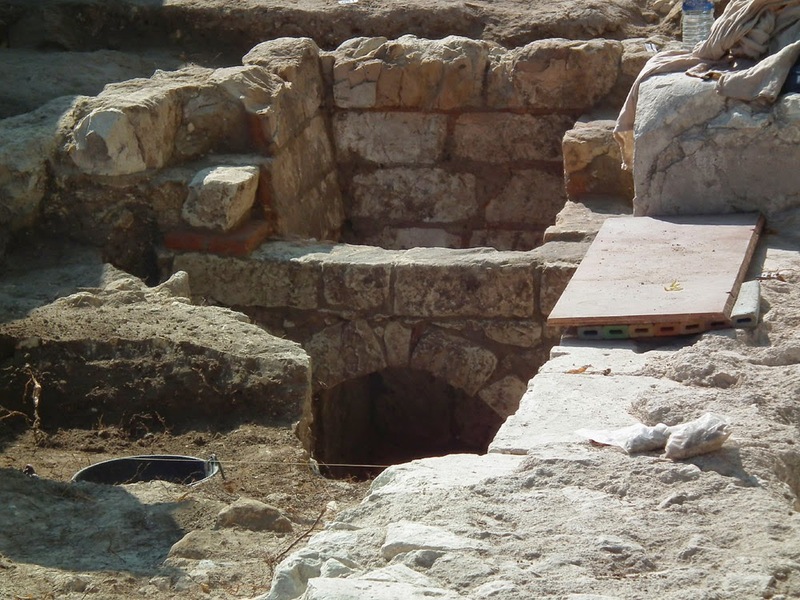 A newly exposed arch in the chapel. Right next to the 14th century Chapel of Saint Louis, a fairly large dog was buried either just before or just after the construction of the chapel. A brooch was also recovered from the grave, possibly indicating that the dog was wrapped in some sort of shroud. If buried after the chapel was built it is a very curious find, since one would not normally expect a dog to be buried in the vicinity of a religious building. However, the local newspaper reminds us that Anne of Brittany, whose 15th century oratory is only a short distance from the chapel, owned a number of much loved greyhounds who accompanied her everywhere. I've also read that her father in law Louis XI, although famously a tremendous miser, shelled out for a pearl and ruby encrusted collar for at least one of his greyhounds, named Mistodin. The dog was apparently also provided with a warm coat at night, as it felt the cold. It is clear that the Vallois royal family were serious dog lovers. A young archaeologist looks down at the 11th century fortress wall. The archaeologists are of course more cautious, and will possibly have the dog bones examined by a specialist to see if they can glean any further information. As far as the archaeologists are concerned, the focus is no longer the chapel, nor the dog, but the remains of a very early medieval wall, 2 m thick and close to the bell casting pit, between the chapel and the Logis Royal. 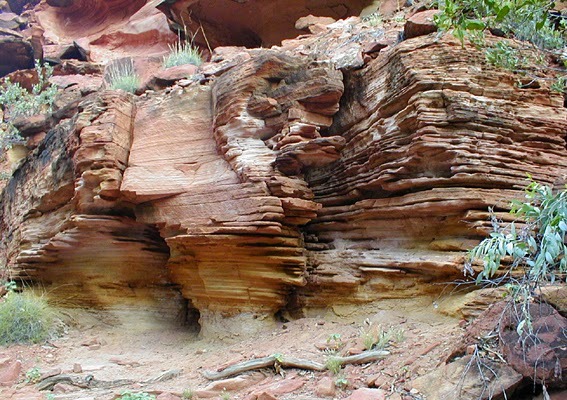 Typical of walls from this period the stones are big and square. It is part of an 11th century fortress, indicating that the old curtain wall followed a different trajectory than today. A la cuisine hier: Poires Belle Helene, the easiest imaginable pear dessert. Poach whole pears. Melt chocolate, cream and poire williams together. Serve the pears with vanilla icecream with the chocolate sauce generously poured over. I didn't make icecream, but instead whipped up a batch of pear cream -- beat together cream cheese, icing sugar and poire williams, fold in beaten egg white. The chocolate sauce was made using a very simple and failsafe method of melting the ingredients -- take a large heavy cast iron frying pan, set on a very low heat and half fill with water; put the chocolate, cream and poire williams in a bowl and set it inside the frying pan; stir periodically until it is all melted and blended. I used frozen cream so it melted along with the chocolate (I've taken to keeping a pot of my local unpasturised cream in the freezer for just such 'emergencies'). Leave out the poire williams if you are serving it to anyone like Simon, whose tastebuds tell him that anything with liquor in it tastes unpleasantly like petrol. Last week our friend Tim came over to the orchard with Betsy, his multi-purpose machine that can be fitted with different sorts of heads for doing different heavy duty tasks in the garden. I wanted the scissor action cutting blade to mow the grass and wildflowers gone to seed down to about 3 inches. Tim operating Betsy in our orchard. The advantage of using Betsy is that she can't be rushed. It's slower and harder work than whizzing around on a ride-on mower, but the cut is more biodiversity friendly. 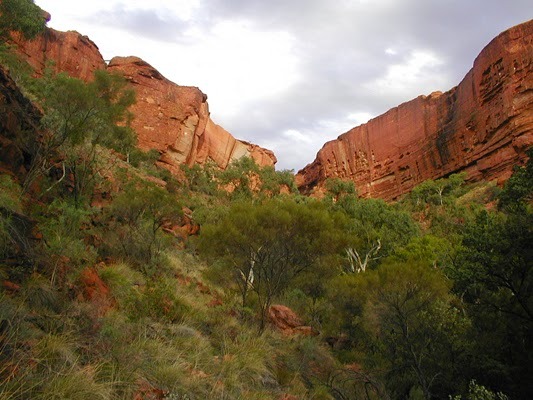 Wasp spiders, snakes, bushcrickets and grasshoppers, voles and frogs have time to amble / slither / hop out of the way, praying mantis can be spotted and encouraged to move on, rather than everything turned into mincemeat. Betsy can cut through unwanted cherry seedlings and other woody plants that threaten to turn the orchard into scrub instead of wooded grassland. She doesn't mulch everything into short lengths that disappear into the sward and form a mat at ground level, but leaves it all long so it can be rolled into windrows and moved to where it is wanted (in this case under the trees to break down and feed them, but not on the open grassland, which needs to be kept low in fertility to suit the orchids and other wildflowers). Tim operated Betsy whilst I followed with a hay rake bundling the clippings up into neat piles. We left one area unmowed to provide habitat for those creatures that prefer longer vegetation, such as the damselflies, wasp spiders, grasshoppers and bushcrickets and anything that will overwinter inside the stems of the more robust plants. The area to be left was chosen on the basis of my discovery of a flowering Autumn Ladys Tresses orchid Spiranthes spiralis, and we left an area about 10 m x 5 m around it. It will get mowed probably in February, depending on the weather. Autumn Ladys Tresses flowering amongst the fruit trees in our orchard. The big advantage of mowing at this time of year is that for a very brief period in early September the orchids (apart from the late flowerers such as the Autumn Ladys Tresses) are dormant, with no visible leaf rosettes to damage underfoot. The seeds from this year's flowers are mature and have mostly been dropped. 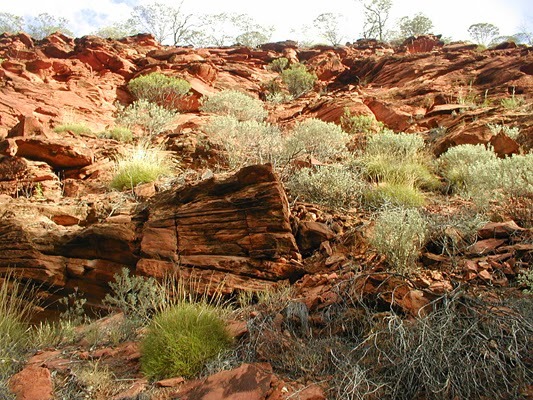 The other vegetation is not too lush and therefore not to full of nutrients, nor too full of moisture to cut. 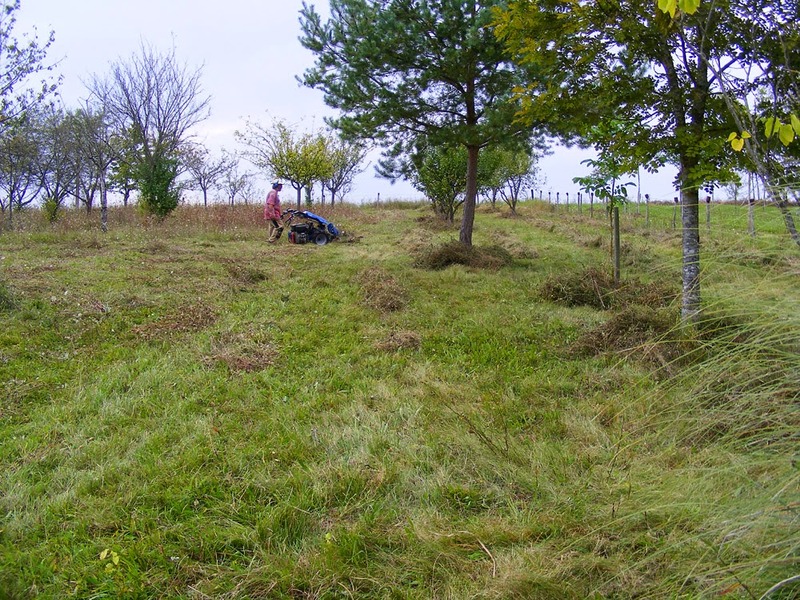 Even if we left it where it fell it wouldn't cause too much increase in fertility of the grassland, but it is best to rake it up and deposit it where it can break down and feed the fruit trees a bit (and suppress the grass around them). Hopefully a win-win situation. Over winter I will try to mattock out the most persistent of the cherry seedlings and maybe, as Tim suggested I do, move some of the other squirrel and jay sown tree seedlings (oak, hazel, ash, walnut) to the boundaries, where they can be planted close to form a hedge. This sort of disturbance has the added advantage of creating little bare patches that orchids and other wildflowers can establish themselves in. It's random, mimicking what might happen if the orchard was grazed over winter for example. In orchards that are managed using a flying flock of sheep or cattle, the beasts trample certain areas more than others, creating bare patches. So far I have repaid Tim for his efforts in spiders and orchid seeds. Ocular News: Simon's gas bubble disappeared yesterday. He says his vision hasn't returned to normal though. It's still a bit distorted if he just uses his left eye, and everything has a strangely yellow tint. For distance the difference in his eyes is not a problem, but he is wearing a patch to block out information from the left eye for close work. His final appointment with the ophthalmic surgeon is 24 September, and she says she will give him a prescription for new glasses then. A la cuisine hier: A beany vegetabley soupy stew, high in fibre and protein, low in fat. Ideal for a fast day (our first since Simon's eye trouble). I used my last juniper berries in a batch of boar bourguignon, but since juniper grows wild on every limestone slope here it is not a problem. Simply go out and pick some more. 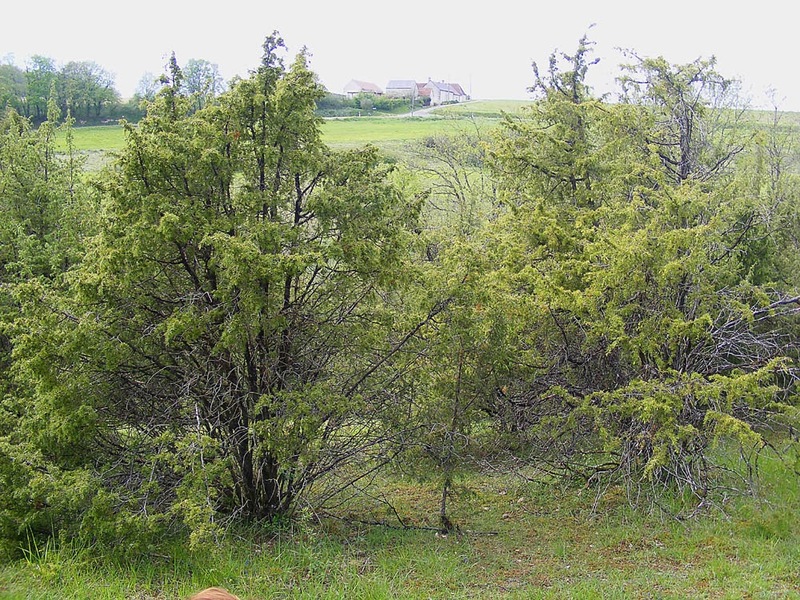 European Juniper Juniperus communis, with berries in different stages of maturity. 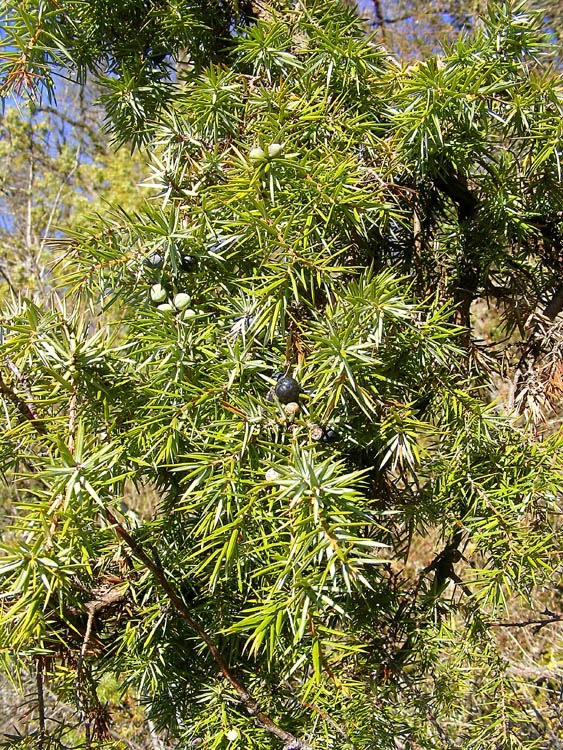 Juniper has berries at all stages of development all year round, so you can usually find some ripe ones to pick. The best time is autumn though, when a lot of berries are ripe, but haven't been eaten yet by hungry wildlife over winter. Juniper is viciously prickly, so if you are organised you will have remembered to take a bucket and thornproof gloves on your foraging mission (or if you are like me you just stop on the way home from some other errand and pick a few with your bare hands and bad language). 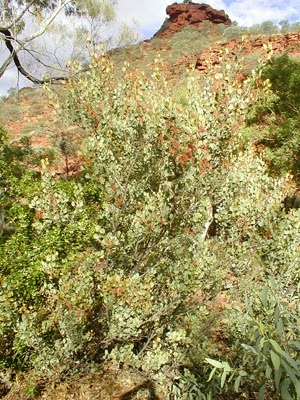 Juniper scrub on the Eperon Barré de Murat. 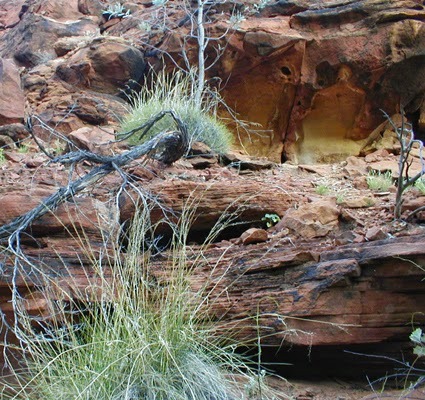 Sheep are traditionally grazed on these steep limestone sites, and juniper is one of the few plants they won't eat, so it proliferates. You need to pick berries that are black and ideally slightly wrinkled looking. They impart a spicy herby flavour to casseroles and dry salt cures for pork or duck and they are best if crushed a bit to release their flavours before putting in the mix. A la cuisine hier: Coq au vin, made not with a rooster but a hen from a local small scale producer, some left over Beaujolais, our aged orchard neighbour's oxheart tomatoes and our own homegrown little onions. I also took the opportunity to make a big batch of chicken stock from the carcass and some extra chicken necks. I'm always amazed by how much meat there is on a chicken neck if you take the time to pick it off -- which I did, since cooked shredded chicken meat is always useful to have on hand. Au jardin hier: More 'hay' raked into windrows. The resident hare is grateful we left an area unmowed, as it was resting up in there yesterday. Of course I only noticed it because it shot off into the neighbouring orchard once I was within a few metres of it. More grapes and pears picked. 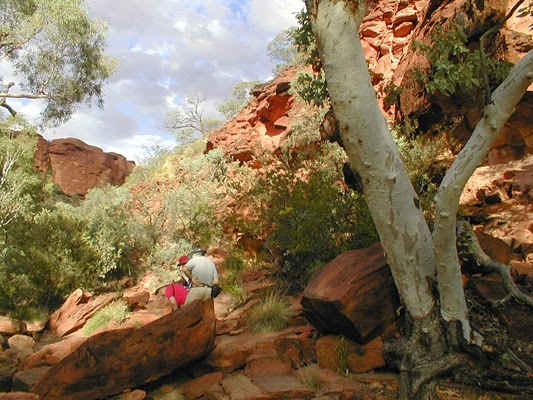 A typical Australian desert scene, with the escarpment surrounding Kings Canyon in the distance. A la cuisine hier: Beans, potato wedges, bacon and fried eggs. This is because I spent the afternoon at a botany outing on the Loire sands near Berthenay. Simon's eye is improving all the time, but he is still not to be trusted with knives and so forth in the kitchen, so he had to wait until I got home to rustle up something to eat. 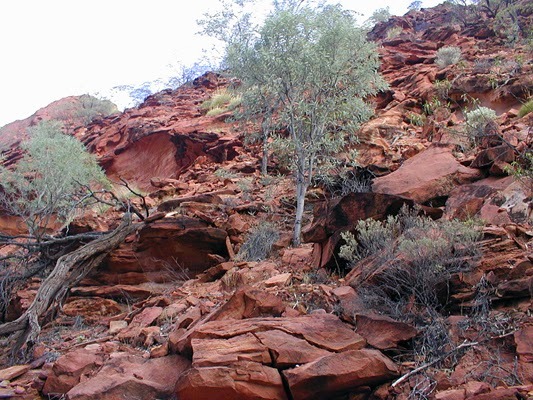 The soil is red and the ants are red in the Red Centre of Australia. A la cuisine hier: Bavette (a thin steak cut along the grain), flash fried and served with diced homegrown potatoes fried in duck fat and homegrown caramelised onions made into a sort of fusion oriental gravy. Pears poached in lightly spiced syrup. 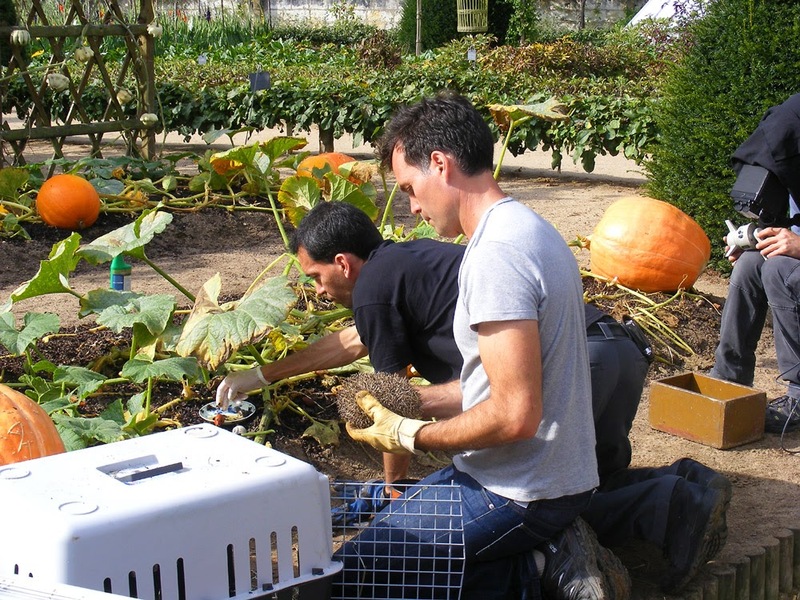 The pears are organic and were a gift from the world famous gardens of Villandry. The syrup, flavoured with vanilla, allspice, black pepper, cardamon, lime and star anise has been filtered and set aside to make sorbet. What's Under the Chapel at the Logis Royal?